I was clearing out some of my storage unit today of a bunch of old photos and negs and came across this photo, yes a real print, not digital. 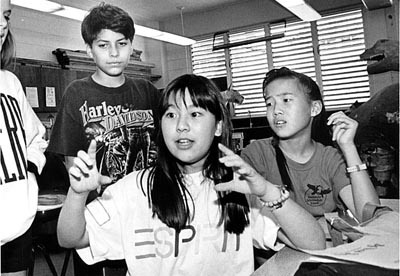 It’s Maile when she was 13 years-old in intermediate school talking about some trip to Florida. As many photographers can attest we can remember many of the assignments clearly that we’ve shot, even though it was long ago or seemingly routine. Sometimes we can’t remember a darn thing from an assignment that should have stuck in our memories. I remember shooting this photo. Maile was a maelstrom, arms flying about, dominating the conversation beyond her helpless classmates as you can see that they are at a loss. So I remember it well which surprises her. But that was a half a lifetime away for her, she’s double that age now. It’s a fraction for me so memories are clearer, score one for being older. You can read about what she has to say and see the back of the photo, which she said has the wrong name for her classmate on the right via her own blog at MonkeyPrints. Whenever I see her she’s a 13 year-old kid in my mind. Some photos and assignments just stick.